This article is about the private institution founded in 1831. For other and similar uses, see University of New York. "Nyu" redirects here. For the district in Japan, see Nyū District, Fukui. For the Elfen Lied character, see List of Elfen Lied characters § Nyu. For the class that matriculated in the fall of 2019, NYU received nearly 85,000 applications for its undergraduate programs. In 2019, NYU was ranked #43 or higher among universities worldwide by the Academic Ranking of World Universities, QS World University Rankings, Times Higher Education World University Rankings, and U.S. News & World Report. Alumni include heads of state, royalty, eminent scientists, inventors and entrepreneurs, media figures, founders and CEOs of Fortune 500 companies, and astronauts. As of March 2019[update], 37 Nobel Laureates, 8 Turing Award winners, 5 Fields Medalists, over 30 Academy Award winners, over 30 Pulitzer Prize winners, and hundreds of members of the National Academies of Sciences and United States Congress have been affiliated as faculty or alumni. Globally, NYU is ranked 7th by the Times Higher Education World University Rankings for producing alumni who are millionaires, and 4th by Wealth-X for producing ultra high net-worth and billionaire alumni. Albert Gallatin, Secretary of Treasury under Thomas Jefferson and James Madison, declared his intention to establish "in this immense and fast-growing city ... a system of rational and practical education fitting and graciously opened to all". A three-day-long "literary and scientific convention" held in City Hall in 1830 and attended by over 100 delegates debated the terms of a plan for a new university. These New Yorkers believed the city needed a university designed for young men who would be admitted based upon merit rather than birthright or social class. On April 18, 1831, an institution was established, with the support of a group of prominent New York City residents from the city's merchants, bankers, and traders. Albert Gallatin was elected as the institution's first president. On April 21, 1831, the new institution received its charter and was incorporated as the University of the City of New York by the New York State Legislature; older documents often refer to it by that name. The university has been popularly known as New York University since its inception and was officially renamed New York University in 1896. In 1832, NYU held its first classes in rented rooms of four-story Clinton Hall, situated near City Hall. In 1835, the School of Law, NYU's first professional school, was established. Although the impetus to found a new school was partly a reaction by evangelical Presbyterians to what they perceived as the Episcopalianism of Columbia College, NYU was created non-denominational, unlike many American colleges at the time. American Chemical Society was founded in 1876 at NYU. It became one of the nation's largest universities, with an enrollment of 9,300 in 1917. NYU had its Washington Square campus since its founding. The university purchased a campus at University Heights in the Bronx because of overcrowding on the old campus. NYU also had a desire to follow New York City's development further uptown. NYU's move to the Bronx occurred in 1894, spearheaded by the efforts of Chancellor Henry Mitchell MacCracken. The University Heights campus was far more spacious than its predecessor was. As a result, most of the university's operations along with the undergraduate College of Arts and Science and School of Engineering were housed there. NYU's administrative operations were moved to the new campus, but the graduate schools of the university remained at Washington Square. In 1914, Washington Square College was founded as the downtown undergraduate college of NYU. In 1935, NYU opened the "Nassau College-Hofstra Memorial of New York University at Hempstead, Long Island". This extension would later become a fully independent Hofstra University. In the late 1960s and early 1970s, financial crisis gripped the New York City government and the troubles spread to the city's institutions, including NYU. Feeling the pressures of imminent bankruptcy, NYU President James McNaughton Hester negotiated the sale of the University Heights campus to the City University of New York, which occurred in 1973. In 1973, the New York University School of Engineering and Science merged into Polytechnic Institute of Brooklyn, which eventually merged back into NYU in 2014 forming the present Tandon School of Engineering. After the sale of the Bronx campus, University College merged with Washington Square College. In the 1980s, under the leadership of President John Brademas, NYU launched a billion-dollar campaign that was spent almost entirely on updating facilities. The campaign was set to complete in 15 years, but ended up being completed in 10. In 1991, L. Jay Oliva was inaugurated the 14th president of the university. Following his inauguration, he moved to form the League of World Universities, an international organization consisting of rectors and presidents from urban universities across six continents. The league and its 47 representatives gather every two years to discuss global issues in education. In 2003 President John Sexton launched a $2.5 billion campaign for funds to be spent especially on faculty and financial aid resources. Under Sextons leadership, NYU also began its radical transformation into a global university. In 2009, the university responded to a series of New York Times interviews that showed a pattern of labor abuses in its fledgling Abu Dhabi location, creating a statement of labor values for Abu Dhabi campus workers. A 2014 follow-up article found that while some conditions had improved, contractors for the multibillion-endowment university were still frequently subjecting their workers to third-world labor conditions. The article documented that these conditions included confiscation of worker passports, forced overtime, recruitment fees and cockroach-filled dorms where workers had to sleep under beds. According to the article, workers who attempted to protest the NYU contractors' conditions were promptly arrested. Reports also claimed that those arrested by police were later abused at the police station. Many workers who were not local were then deported to their home countries. The university quickly responded to the reports with an apology to the workers. In 2015, NYU compensated thousands of migrant workers on its Abu Dhabi complex. From 2007 to 2018, NYU experienced a 114% increase in applications to its university system, increasing from around 35,000 applicants to nearly 85,000 in 2019. This has also caused the acceptance rate to drop significantly, with a record-low acceptance rate of 16% in 2019. In parallel to NYU's expansion in the early 1900s, the university similarly expanded vigorously in the early 2000s, becoming the largest private university in the United States with a combined undergraduate/graduate enrollment of over 59,000 students as of 2018. In August 2018, the New York University School of Medicine announced it would be offering full-tuition scholarships to all current and future students in its MD program regardless of need or merit, making it the only top-10 medical school in the United States to do so. The university logo, the upheld torch, is derived from the Statue of Liberty, signifying NYU's service to New York City. 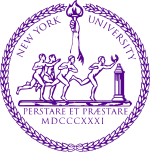 The torch is depicted on both the NYU seal and the more abstract NYU logo, designed in 1965 by renowned graphic designer Tom Geismar of the branding and design firm Chermayeff & Geismar. There are at least two versions of the possible origin of the university color, violet. Some believe that it may have been chosen because violets are said to have grown abundantly in Washington Square and around the buttresses of the Old University Building. Others argue that the color may have been adopted because the violet was the flower associated with Athens, the center of learning in ancient Greece. Washington Square and Greenwich Village have been hubs of cultural life in New York City since the early 19th century. Much of this culture has intersected with NYU at various points in its history. Artists of the Hudson River School, the United States' first prominent school of painters, settled around Washington Square. Samuel F.B. Morse, a noted artist who also pioneered the telegraph and created the Morse Code, served as the first chair of Painting and Sculpture. He and Daniel Huntington were early tenants of the Old University Building in the mid-19th century. (The University rented out studio space and residential apartments within the "academic" building.) As a result, they had notable interaction with the cultural and academic life of the university. In the 1870s, sculptors Augustus Saint-Gaudens and Daniel Chester French lived and worked near the Square. By the 1920s, Washington Square Park was nationally recognized as a focal point for artistic and moral rebellion. As such, the Washington Square campus became more diverse and bustled with urban energy, contributing to academic change at NYU. Famed residents of this time include Eugene O'Neill, John Sloan, and Maurice Prendergast. In the 1930s, the abstract expressionists Jackson Pollock and Willem de Kooning, and the realists Edward Hopper and Thomas Hart Benton had studios around Washington Square. In the 1960s the area became one of the centers of the beat and folk generation, when Allen Ginsberg and Bob Dylan settled there. This led to tension with the university, which at the time was in the midst of an aggressive facilities expansion phase. In 1975, the university opened The Grey Art Gallery at 100 Washington Square East, housing the NYU art collection and featuring museum quality exhibitions. NYU has successfully completed a seven-year, $2.5 billion campaign, surpassing expectations by raising more than $3 billion over the seven-year period. Started in 2001, this campaign was the university's largest in its history, in which they planned to "raise $1 million per day for scholarships and financial aid, faculty building, new academic initiatives, and enhancing NYU's physical facilities". The campaign included a $50 million gift from the Tisch family (after which one building and the art school are named) and a $60 million gift from six trustees called "The Partners Fund", aimed at hiring new faculty. On October 15, 2007 the university announced that the Silver family donated $50 million to the School of Social Work, which will be renamed as a result. This is the largest donation ever to a school of social work in the United States. The 2007–2008 academic year was the most successful fundraising year to date for NYU, with the school raising $698 million in only the first 11 months of the year, representing a 70% increase in donations from the prior year. The University also recently announced plans for NYU's Call to Action, a new initiative to ask alumni and donors to support financial aid for students at NYU. The university has announced a 25-year strategic development plan, scheduled to coincide with its bicentennial in 2031. Included in the "NYU 200" plans are increasing resident and academic space, hiring additional faculty, and involving the New York City community in a transparent planning process. Additionally, NYU hopes to make their buildings more environmentally friendly, which will be facilitated by an evaluation of all campus spaces. As a part of this plan, NYU purchased 118 million kilowatt-hours of wind power during the 2006–2007 academic year – the largest purchase of wind power by any university in the country and any institution in New York City. For 2007, the university expanded its purchase of wind power to 132 million kilowatt-hours. As a result, the EPA ranked NYU as one of the greenest colleges in the country in its annual College & University Green Power Challenge. NYU consistently ranks as one of the top fundraising institutions in the country, raising $506.4 million in 2015 and $648 million in 2016. NYU is also the 19th wealthiest university in America with $5.3 billion in cash and investments in fiscal year 2014. NYU's campus in New York City includes more than 171 buildings spread between Manhattan and Brooklyn. Most of NYU's buildings in Manhattan are located across a roughly 230-acre (930,000 m2) area bounded by Houston Street to the south, Broadway to the east, 14th Street to the north, and Sixth Avenue (Avenue of the Americas) to the west. The core of NYU consists of buildings that surround Washington Square Park. In addition to its New York campus, NYU has 49 additional buildings overseas located throughout two 'portal' campuses and 12 Global Academic Centers. With approximately 12,000 undergraduate and graduate residents, NYU had the seventh-largest university housing system in the U.S. as of 2007[update], and one of the largest among private schools. Washington Square Park, with its gateway arch, is surrounded largely by NYU buildings and plays an integral role in the University's campus life. Since the late 1970s, the central part of NYU has been its Washington Square campus in the heart of Greenwich Village. The Washington Square Arch is an unofficial symbol of NYU. Until 2007, NYU had held its commencement ceremonies in Washington Square Park, but moved the ceremonies to Yankee Stadium in 2008 because of renovations to Washington Square. In the 1990s, NYU became a "two square" university by building a second community around Union Square, in close proximity to Washington Square. 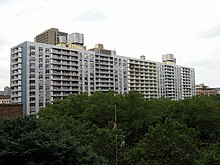 NYU's Union Square community primarily consists of the priority residence halls of Carlyle Court, Palladium Residence Hall, Alumni Hall, Coral Tower, Thirteenth Street Hall, University Hall, Third North Residence Hall, and Founders Hall. NYU operates theaters and performance facilities that are often used by the university's music conservatory and Tisch School of the Arts. External productions are also occasionally held in NYU's facilities. The largest performance accommodations at NYU are the Skirball Center for Performing Arts (850 seats) at 566 LaGuardia Place, just south of Washington Square South, and the Eisner-Lubin Auditorium (560 seats) in the Kimmel Center. Recently, the Skirball Center hosted important speeches on foreign policy by John Kerry and Al Gore. The Skirball Center is the largest performing arts facility south of 42nd Street. The Elmer Holmes Bobst Library, built between 1967 and 1972, is the largest library at NYU and one of the largest academic libraries in the United States. Designed by Philip Johnson and Richard Foster, the 12-story, 425,000-square-foot (39,500 m2) structure sits on the southern edge of Washington Square Park (at 70 Washington Square South) and is the flagship of an eight-library, 4.5 million-volume system. Bobst Library offers one Multidisciplinary Reference Center, a Research Commons, 28 miles (45 km) of open-stacks shelving, and approximately 2,000 seats for student study. The library is visited by more than 6,800 users each day, and circulates more than one million books annually. Bobst's Avery Fisher Center for Music and Media is one of the world's largest academic media centers, where students and researchers use more than 95,000 audio and video recordings per year. The Digital Studio offers a constantly evolving, leading-edge resource for faculty and student projects and promotes and supports access to digital resources for teaching, learning, research and arts events. Bobst Library is also home to many special collections. The Fales Collection houses collections of English and American fiction in the United States, the unique Downtown Collection, documenting the New York literary avante-garde arts scene from the 1970s to the present, and the Food and Cookery Collection, which documents American food history with a focus on New York City. Bobst Library also houses the Tamiment Library, which holds collections in labor history, socialism, anarchism, communism, and American radicalism for scholarly research. Tamiment includes the Robert F. Wagner Labor Archives, the Archives of Irish America, the Center for the Cold War and the U.S., and the Frederic Ewen Academic Freedom Center. NYU's Brooklyn campus is located at MetroTech Center, an urban academic-industrial research park, sits on top of the A C F subway lines, is only a few blocks from the Brooklyn Bridge, and its connected to NYU's Manhattan campus via the NYU Shuttle Bus System. It houses the School of Engineering, the Center for Urban Science and Progress and also several of Tisch School of the Arts and Steinhardt School of Culture, Education, and Human Development's degree programs. The Brooklyn campus also houses NYU's Game Center Open Library, which is the largest collection of games held by any university in the world. In 2014, NYU Langone Medical Center acquired a 125,000 square feet (11,600 m2) healthcare facility in Brooklyn. Quickly following this announcement, NYU announced in 2017 that it would invest over $500 million in the coming years to renovate and expand its Brooklyn campus. The New York University School of Medicine is situated near the East River waterfront at 550 First Avenue between East 30th and 34th Streets. The campus hosts the medical school, Tisch Hospital, and the Rusk Institute of Rehabilitation Medicine. Other NYU Centers across the city include NYU Hospital for Joint Diseases and the Bellevue Hospital Center. NYU's Silver School of Social Work (formerly Ehrenkranz School of Social Work) manages branch campus programs in Westchester County at Sarah Lawrence College and in Rockland County at St. Thomas Aquinas College. In Sterling Forest, near Tuxedo, NYU has a research facility that contains institutes, in particular the Nelson Institute of Environmental Medicine. The Midtown Center at 11 West 42nd Street is home to the NYU Schack Institute of Real Estate. The Woolworth Building in the financial district is home to NYU's professional studies and education programs. NYU has two units located on the Upper East Side. The Institute for the Study of the Ancient World, a discrete entity within NYU, independent of any other school or department of the university, is located on East 84th Street, while the New York University Institute of Fine Arts, a graduate school of art history and fine arts, is located at the James B. Duke Building at 1 East 78th Street. NYU has international houses on its Manhattan campus, including the Deutsches Haus, La Maison Française, Casa Italiana Zerilli Marimò, the Glucksman Ireland House, the King Juan Carlos I of Spain Center, the Hagop Kevorkian Center, an Africa House and a China House. Tisch School of the Arts, Asia was NYU's first branch campus abroad. The result of a partnership between Tisch School of the Arts and the Singapore Government, it offered Master of Fine Arts degrees in animation and digital arts, dramatic writing, film and international media producing. The campus opened in fall 2007 with the intention to enroll approximately 250 students. Anticipated enrolment figures were not achieved, financial irregularities were alleged and President Pari Sara Shirazi was dismissed from her post by NYU in November 2011. She subsequently announced her intention to commence legal proceedings against NYU alleging wrongful termination and defamation. In a letter to the Tisch Asia community dated November 8, 2012, Dean Mary Schmidt Campbell announced that the campus would close after 2014 with recruitment and admission of new students suspended with immediate effect. In 2016, three former students of the now defunct Tisch Asia sued NYU. NYU has a host of foreign facilities used for study away programs, referred to as Global Academic Centers. As of 2012[update], NYU operates 12 academic sites in Africa, Asia and the Middle East, Australia, Europe, North America, and South America, including undergraduate academic-year and summer study abroad programs in Accra, Berlin, Buenos Aires, Florence, London, Los Angeles, Madrid, Paris, Prague, Sydney, Tel Aviv, and Washington, D.C. One of the most noteworthy is the 57-acre (230,000 m2) campus of NYU Florence Villa LaPietra in Italy, bequeathed by the late Sir Harold Acton to NYU in 1994, that at the time was the largest donation to a university in history. In spring 2014, NYU opened a new campus in Paris, in the student area of the Quartier Latin, where NYU Law set up an EU Regulatory Policy Clinic taught by Alberto Alemanno and Vincent Chauvet. In fall 2010, NYU Abu Dhabi (NYUAD) opened as the university's first overseas "Portal Campus" with an inaugural class of 150 students. Unlike NYU's other study abroad centers, NYUAD functions as a separate liberal arts college within a university, offering complete degree programs to students admitted directly to NYUAD. NYUAD recruits students from all over the world and describes itself as the "World's Honor College". The main campus for NYUAD is under construction on Saadiyat Island and is scheduled to open in 2014. Until then the school operates from a campus located in downtown Abu Dhabi. The campus construction and operational costs are entirely funded by the Abu Dhabi government. In 2011, NYU announced plans to open another portal campus, New York University Shanghai, for the fall semester of 2013. It was set to have about 3,000 undergraduate students, the majority of whom would be Chinese. It was approved by the Ministry of Education of the People's Republic of China in January 2011. NYU's local partner will be East China Normal University (ECNU). ECNU's president Yu Lizhong will be the chancellor and play a major role in government relations while Jeffrey S. Lehman, former president of Cornell amongst other positions, will serve as vice chancellor and have "free rein in academic affairs". NYU houses approximately 12,000 undergraduate and graduate residents, and had the seventh-largest university housing system in the U.S. as of 2007[update], and one of the largest among private schools. NYU's undergraduate housing system consists of more than 20 residence halls and is governed by the Inter-Residence Hall Council (IRHC), an umbrella student council organization. Uniquely, many of NYU's residence halls are converted apartment complexes or old hotels. In general, NYU residence halls receive favorable ratings, and some are opulent. Many rooms are spacious and contain amenities considered rare for individual college residence hall rooms, such as kitchens, lavatories, living rooms and common areas. The university operates its own transit system to transport its students by bus to its campus. A few of the Residence Halls are considered to be amongst the nicest in the nation, being furnished with granite counter-tops, stainless-steel appliances, in-hall gyms, wood flooring, marble bathroom fixtures, large floor lounges, floor to ceiling windows and extensive views of lower and midtown Manhattan. Undergraduate students are guaranteed housing during their enrollment at NYU and are split into two categories, FYRE (First-Year Residential Experience) and TRUE (The Residential Upperclassmen Experience). Most FYRE halls are located near the Washington Square area. While nearly all TRUE halls are located near the Union Square area, two former residence halls were located in the Financial District and one is still in use in Chinatown. Two residence halls are located in and around the MetroTech Commons, intended to serve NYU's Brooklyn Campus. In 2007, the National Association of College and University Residence Halls (NACURH) named NYU the National School of the Year for IRHC and NRHH's strong efforts over the past year. In addition, NYU was named the National Program of the Year for UltraViolet Live, the annual inter-hall competition that raises funds for Relay For Life. NYU has made the greening of its campus a large priority. For example, NYU has been the largest university purchaser of wind energy in the U.S. since 2009. With this switch to renewable power, NYU is achieving benefits equivalent to removing 12,000 cars from the road or planting 72,000 trees. In May 2008, the NYU Sustainability Task Force awarded $150,000 in grants to 23 projects that would focus research and efforts toward energy, food, landscape, outreach, procurement, transportation and waste. These projects include a student-led bike-sharing program modeled after Paris' Velib program with 30 bikes free to students, staff, and faculty. NYU received a grade of "B" on the College Sustainability Report Card 2010 from the Sustainable Endowments Institute. NYU purchased 118 million kilowatt-hours of wind power during the 2006–2007 academic year – the largest purchase of wind power by any university in the country and any institution in New York City. For 2007, the university expanded its purchase of wind power to 132 million kilowatt-hours. The EPA ranked NYU as one of the greenest colleges in the country in its annual College & University Green Power Challenge. In 2007, NYU created a strategic plan for a six billion dollar 25 year, 6,000,000-square-foot (560,000 m2) expansion scheduled to conclude by the universities bicentennial in 2031. Details of the plan include 2,000,000 sq ft (190,000 m2) of additional on-campus housing and 3,500,000 sq ft (330,000 m2) of modern academic spaces spread between NYU's New York City campuses. The expansion started in earnest in 2017 with the groundbreaking of 181 Mercer Street, a new multi-purpose building that will act as the flagship athletic facility for NYU, while also accompanying a 350-bed Residence Hall, 58 general purpose classrooms and a 350-seat theater. The roughly 800,000-square-foot (74,000 m2), $1.1 billion building is directly adjacent to the south eastern corner of the Washington Square campus and represents a significant focus on the university owner super blocks. Work on the plans second project, 370 Jay Street, a 500,000-square-foot (46,000 m2) addition to the Brooklyn campus is scheduled to conclude in 2019. The building will house 'the digital arts and sciences' such as the Tandon School of Engineering departments of Computer Science, Electrical and Computer Engineering; the Tisch School of the Arts Clive Davis Institute for Recorded Music and Game Center and various other NYU initiatives such as the Center for Urban Science and Progress (CUSP) and NYU Wireless (5G research). To date, NYU has confirmed specific construction details for its NYU 2031 plan to the tune of 1,300,000 sq ft (120,000 m2) at a cost of $1.6 Billion with roughly 12 years to go until the universities bicentennial. In order to meet the plans outlined goals on time, the university would have to significantly increase spending, fundraising and construction over the next decade. Note: Statistics include NYU's global university network. Admission to NYU is highly selective. For the undergraduate first-year class of 2023, 16% were admitted from an applicant pool of 84,481. Of those admitted, about 6,500 made up the total enrollment for the class, representing 88 countries and all 50 states. Most freshmen have a typical unweighted GPA of 3.7/A (90–95%) and are in the top 10% of their high school graduating class. The median SAT score was 1480 (out of 1600). The student-to-faculty ratio at the New York campus is 10:1, and less than that at the Abu Dhabi and Shanghai campuses. The average scholarship amount awarded to freshmen is over $35,000, and 20% of freshmen received Pell Grants. As of 2016[update], NYU's graduate schools have acceptance rates of 1.8% to the School of Medicine, 23% to the School of Business, 28% to the School of Engineering, 29% to the Graduate School of Arts and Science, and 34% to the School of Law. Average MCAT score of students at the School of Medicine is 36/45, average GMAT score of graduate students at the School of Business is 710/800, and average LSAT score of students at the School of Law is 171/180. Flags identify NYU buildings around the city. This flag is for the Gallatin School of Individualized Study. NYU is a private, global, sectarian and not-for-profit institution of higher education organized into 10 undergraduate schools and 15 graduate/professional schools, with a roughly even split of students between the divisions. Arts and Science is currently NYU's largest academic division. It has three subdivisions: the College of Arts and Science, the Graduate School of Arts and Science, and the Liberal Studies program. The College of Arts and Science and Liberal Studies program are undergraduate divisions, and the former has existed since the founding of NYU. According to NYU, it has created a 'global network university' with its primary campus, two 'portal' campuses, and 12 academic sites. The 'portal' campuses at NYU Shanghai and NYU Abu Dhabi function as full-fledged colleges, allowing students to study all four years of their undergraduate studies and receive a degree, never having stepped foot on what would be considered NYU's traditional campus in New York. The academic sites at Accra, Berlin, Buenos Aires, Florence, London, Los Angeles, Madrid, Paris, Prague, Sydney, Tel Aviv, and Washington, D.C. function as study away sites, allowing students to spend up to a year away from their home campus. NYU, citing a report by the Institute of International Education, asserts that it has sent more students abroad and brought more international students in than any other university for five continuous years. The President of New York University, is selected by the Board of Trustees and serves as the primary executive officer of the university for an unspecified term length. On March 18th, 2015, Andrew D. Hamilton became the 16th and current President of NYU. His administration's current objectives include measures of strengthening NYU's science and engineering departments, expanding diversity and inclusionary practices, maintaining its status as a global university and attempting to make the university broadly more affordable. NYU manages one of the largest annual collegiate research budgets of any university in the United States. In 2014, NYU received $524 million in research grants from the National Science Foundation alone. NYU School of Medicine received $305 million in external research funding from the National Institutes of Health in 2014. NYU was granted 90 patents in 2014, the 19th most of any institution in the world. NYU owns the fastest supercomputer in New York City. As of 2016[update], NYU hardware researchers and their collaborators enjoy the largest outside funding level for hardware security of any institution in the United States, including grants from the National Science Foundation (NSF), the Office of Naval Research, the Defense Advanced Research Projects Agency (DARPA), the United States Army Research Laboratory, the Air Force Research Laboratory, the Semiconductor Research Corporation, and companies including Boeing, Microsoft, and Google. Nationally, NYU is ranked 20th in the Center for World University Rankings, 19th by QS World University Rankings, 22nd in the Academic Ranking of World Universities, 27th by Business Insider, and 30th by U.S. News & World Report. Globally, NYU is ranked 25th in the Center for World University Rankings, 16th in International Colleges and Universities, 32nd in the Academic Ranking of World Universities, 27th in the Times Higher Education World University Rankings, and 46th in the QS World University Rankings. Additionally, NYU is ranked 26th in the Times Higher Education World University Rankings Reputation Rankings. U.S. News & World Report ranks NYU's graduate schools 6th for law, 6th for public policy, 9th for math (1st for applied math), 10th for Occupational therapy under Steinhardt School of Culture, Education, and Human Development, 10th for business, 11th for economics, 12th for political science, 12th for medical school research, 13th for education, 12th for nursing, 27th for physical therapy, 29th for computer science, 30th for psychology, and 45th for engineering. Globally, NYU's social sciences are ranked 8th by the Academic Ranking of World Universities, 15th by the Times Higher Education World University Rankings, and 16th by the QS World University Rankings. NYU is globally ranked 11th for psychology by the QS World University Ranking. The Social Psychology Network ranks NYU 5th for industrial/organizational psychology, 14th for clinical psychology, and U.S. News & World Report ranks NYU 9th for social psychology and 9th for behavioral neuroscience. U.S. News & World Report ranks the New York University School of Law 1st for tax law and 1st for international law. The publication also ranks The Robert F. Wagner Graduate School of Public Service 6th in public policy. The NYU Department of Philosophy is globally ranked 1st by The Philosophical Gourmet Report and the QS World University Rankings. NYU is ranked 1st for New Ivies by college resource guide Unigo. In 2006, NYU was named by Kaplan as one of the "New Ivies". The annual Global Employability Survey in The New York Times ranks NYU 11th nationally and 29th globally for employability. For four consecutive years NYU has been ranked as America's "#1 dream school" by the Princeton Review. NYU is consistently ranked as a "Top 10 Dream College" for both parents and students according to The Princeton Review. Alongside Stanford University, Harvard College, Princeton University, and Massachusetts Institute of Technology, NYU is one of few universities to regularly appear in the top 10 list for both parents and students. NYU ranks 19th in the world based on the number of patents generated. NYU ranked 7th among the World's top 100 universities for producing millionaires, as compiled by Times Higher Education World University Rankings. NYU ranked 5th globally among universities with the highest number of alumni worth $30 million or more, as compiled by ABC News. CNBC ranked NYU 4th globally among universities with the most billionaire graduates. The Student Government Assembly (SGA) is the governing student body at NYU. The SGA has been involved in controversial debates on campus, including a campus-wide ban on the sale of Coca-Cola products in 2005, and the Graduate Student Organizing Committee unionization in 2001 and subsequent strike in 2005. This ban was lifted by the University Senate on February 5, 2009. SGA consists of 75 voting members from subsidiary student government organs including the Student Senators Council (SSC) and the Presidents Council, which are elected from their respective individual undergraduate and graduate colleges. In 2018, the structure of the universities student government was called into question by numerous students through school newspapers and social media pages calling for "sweeping changes to its byzantine structure." Advocates claimed the structure of SGA failed to represent all students, wasted university funds and operated in an undemocratic manner. Opponents claimed that advocates were merely motivated by legislation supporting the BDS movement that was likely to pass. A bus system transports students to and from the far ends of campus. NYU has over 450 student clubs and organizations on campus. In addition to the sports teams, fraternities, sororities, and study clubs, there are many organizations on campus that focus on entertainment, arts, and culture. These organizations include various student media clubs: for instance, the daily student newspaper the Washington Square News, the NYU Local daily blog, The Plague comedy magazine, "Washington Square Local web-based satire news source, and the literary journals Washington Square Review and The Minetta Review, as well as student-run event producers such as the NYU Program Board and the Inter-Residence Hall Council. It also operates radio station WNYU-FM 89.1 with a diverse college radio format, transmitting to the entire New York metropolitan area from the original campus, and via booster station WNYU-FM1 which fills in the signal in lower Manhattan from atop one of the Silver Towers, next to the football field at the Washington Square campus. The New York University Mock Trial team is consistently ranked as one of the best collegiate mock trial teams in the country. NYU has qualified for the National Championship Tournament for 10 consecutive seasons and placed in the top 10 during each of those years. In the 2009–2010 season, NYU won the 26th National Championship Tournament in Memphis over rival Harvard. The following season, they qualified for the final round once more only to be the runners-up to UCLA. In the American Mock Trial Association's 2015–2016 power rankings, NYU ranks third, behind Harvard and Yale. During the University Heights era, an apparent rift evolved with some organizations distancing themselves from students from the downtown schools. The exclusive Philomathean Society operated from 1832 to 1888 (formally giving way in 1907 and reconstituted into the Andiron Club). Included among the Andiron's regulations was "Rule No.11: Have no relations save the most casual and informal kind with the downtown schools". The Eucleian Society, rival to the Philomathean Society, was founded in 1832. The Knights of the Lamp was a social organization founded in 1914 at the School of Commerce. This organization met every full moon and had a glowworm as its mascot. The Red Dragon Society, founded in 1898, is thought to be the most selective society at NYU. In addition, NYU's first yearbook was formed by fraternities and "secret societies" at the university. NYU has traditions which have persisted across campuses. Since the beginning of the 20th century initiation ceremonies have welcomed incoming NYU freshmen. At the Bronx University Heights Campus, seniors used to grab unsuspecting freshmen, take them to a horse-watering trough, and then dunk them head-first into what was known colloquially as "the Fountain of Knowledge". This underground initiation took place until the 1970s. Today freshmen take part in university-sponsored activities during what is called "Welcome Week". In addition, throughout the year the university traditionally holds Apple Fest (an apple-themed country fest that began at the University Heights campus), the Violet Ball (a dance in the atrium of Bobst Library), Strawberry Fest (featuring New York City's longest Strawberry Shortcake), and the semi-annual midnight breakfast where Student Affairs administrators serve free breakfast to students before finals. Students publish a campus comedy magazine, The Plague. Like many college humor magazines, this often pokes fun at popular culture as well as campus life and the idiosyncrasies of New York University. The Plague was founded in 1978 by Howard Ostrowsky along with Amy Burns, John Rawlins, Joe Pinto and Dan Fiorella, and is currently published once per semester. It is not NYU's first humor magazine, as The Medley was a humor magazine published by the Eucleian Society from 1913 to 1950. Some of the first fraternities in the country were formed at NYU. Greek life first formed on the NYU campus in 1837 when Psi Upsilon chartered its Delta Chapter. The first fraternities at NYU were social ones. With their athletic, professional, intellectual, and service activities, later groups sought to attract students who also formed other groups. Since then, Greek letter organizations have proliferated to include 25 social fraternities and sororities. As of 2014[update], approximately 13% of NYU students are members of fraternities or sororities. Four governing boards oversee Greek life at the university. The Interfraternity Council (IFC) has jurisdiction over all twelve recognized fraternities on campus. Eight sororities are under the jurisdiction of the Panhellenic Council (PhC), which features seven national sororities (ΔΦΕ, ΑΕΦ, ΑΣΤ, ΠΒΦ, ΚΚΓ, ΖΤΑ, ΔΓ) and two local sororities (ΑΦΖ and ΘΦΒ). Five multicultural organizations maintain membership in the Multicultural Greek Council (MGC), including two fraternities and three sororities. All three of the aforementioned boards are managed under the auspices of the Inter-Greek Council. Greek organizations have historical significance at NYU. Delta Phi Epsilon, Zeta Psi, Alpha Epsilon Pi, Tau Delta Phi, Alpha Kappa Psi and Delta Sigma Pi were founded at NYU. Zeta Psi Fraternity of North America was chartered in 1847, Delta Sigma Pi in 1907, Alpha Epsilon Pi in 1913, and Alpha Phi Omega in 1938. Delta Phi Epsilon was founded in 1917. The NYU Gamma chapter of Delta Phi, founded in 1841, is the longest continuously active fraternity chapter in the world, having never gone inactive since its establishment. Delta Phi is also the oldest continuously active fraternity in the United States, being the only organization in the original Union Triad to remain active since its institute. The NYU Gamma chapter of Zeta Beta Tau is the oldest active ΖΒΤ chapter in the country. NYU does not have an ROTC program on campus. However, NYU students may participate in the U.S. Army ROTC program through NYC Army ROTC, headquartered at Fordham University. NYU's sports teams are referred to as the NYU Violets, the colors being the trademarked hue "NYU Violet" and white. Since 1981, the school mascot has been a bobcat, whose origin can be traced back to the abbreviation then being used by the Bobst Library computerized catalog—short: Bobcat. NYU's sports teams include baseball, men's and women's varsity basketball, cross country, fencing, golf, soccer, softball, swimming and diving, tennis, track and field, volleyball, and wrestling. Most of NYU's sports teams participate in the NCAA's Division III and the University Athletic Association, while fencing and ice hockey participate in Division I. While NYU has had All-American football players, the school has not had a varsity football team since 1952. NYU students also compete in club and intramural sports, including badminton, baseball, basketball, crew, cycling, equestrianism, ice hockey, lacrosse, martial arts, rugby, softball, squash, tennis, triathlon, and ultimate. The Palladium Athletic Facility serves as the home base of NYU's Varsity and Club intercollegiate athletic teams, while NYU's 404 and Brooklyn athletic facilities offer additional space for the NYU fitness community. Many of NYU's varsity teams play their games at various facilities and fields throughout Manhattan because of the scarcity of space for playing fields near campus. NYU is currently in the process of building a new billion dollar flagship athletic facility known as 181 Mercer Street. When complete, the new home of NYU Athletics will host a six-lane swimming pool, four full basketball courts, a complete in-door running track and other sports related offerings. NYU has 470,000 living alumni as of 2015[update]. At least 37 Nobel Prize winners are affiliated with NYU. NYU is associated with a great number of important inventions and discoveries. For example, cardiac defibrillator and artificial cardiac pacemaker (Barouh Berkovits), closed-chest cardiac defibrillator (William B. Kouwenhoven), laser (Gordon Gould), atom bomb (Frederick Reines), polio vaccine (Albert Sabin), RFID (Mario Cardullo), telephone handset (Robert G. Brown), wireless microphone (Hung-Chang Lin), first digital image scanner (Russell A. Kirsch), television (Benjamin Adler), light beer (Joseph Owades), non-stick cookware (John Gilbert), black hole thermodynamics (Jacob Bekenstein), polymer science (Herman Francis Mark), microwave (Ernst Weber), X-ray crystallography (Paul Peter Ewald), barcode (Jerome Swartz), structure of the DNA (Francis Crick), tau lepton (Martin Lewis Perl), processes for creating food coloring, decaffeination and sugar substitute (Torunn Atteraas Garin), processes for the mass production of penicillin (Jasper H. Kane), X-ray generator and rotational radiation therapy (John G. Trump), nuclear reactor and hydrogen bomb (John Archibald Wheeler), and contact lenses (Norman Gaylord), among many others. Alumnus Fred Waller who invented Cinerama and the Waller Gunnery Trainer, also obtained the first patent for a water ski. The first patents for touch screen cash machine (Richard J. Orford), and zoom lens (Leonard Bergstein), were also obtained by NYU alumni. Some of the most prolific inventors in American history are NYU alumni, for example Jerome H. Lemelson whose 605 patents involved the cordless telephone, fax machine, videocassette recorder and camcorder, among others; Samuel Ruben whose inventions include electric battery; James Wood who invented cable-lift elevator, fabricated the steel cables for the Brooklyn Bridge and contributed to the development of lockmaking, submarine, electric generator, electric motor, transformer and the design of the refrigerator; and Albert Macovski whose innovations include the single-tube color camera and real-time phased array imaging for ultrasound. NYU is the birthplace of the tractor beam and 5G. Before and during World War II, NYU's Tandon School of Engineering worked on problems whose solution led to the development of radar, and later broke ground in electromagnetic theory, electronics in general, and solved re-entry problems of the manned space capsules, as well as helped develop and design the NASDAQ Automated Quote System and trading floors. Developer of the early telephone systems in the United States Bancroft Gherardi Jr., developer of the submarine communications facilities Jack M. Sipress, inventor of Italy's first computer Mario Tchou, designer of the Panama Canal locks Henry C. Goldmark, designer of the Pentagon Hugh John Casey, designer of the Apollo Lunar Module Thomas J. Kelly, as well as the designer of virtually every major bridge in New York City from the George Washington to the Verrazano, Leopold Just, are also NYU alumni. Many of the world's most renowned companies, such as IBM (Charles Ranlett Flint), Twitter (Jack Dorsey), Bloomberg L.P. (Charles Zegar), Jacobs Engineering Group (Joseph J. Jacobs), Hudson Group (Robert B. Cohen), MTV (Tom Freston), Barnes & Noble (Leonard Riggio), Northrop Grumman (William T. Schwendler), Automatic Data Processing (Henry Taub), Duracell (Samuel Ruben), Bugle Boy (William C. W. Mow), Virgin Mobile USA (Dan Schulman), among many others, were founded or co-founded by NYU alumni. Likewise, many of the world's most famous companies were either owned or led by NYU alumni. For example, Lockheed Martin (Robert J. Stevens), Xerox (Ursula Burns), Yahoo! (Alfred Amoroso), TPV Technology (Jason Hsuan), 20th Century Fox (Marvin Davis), BAE Systems Inc (Mark Ronald), AECOM (John Dionisio), Pfizer (John Elmer McKeen), Ingersoll Rand (Herbert L. Henkel), General Motors (Alfred P. Sloan), Sears (Arthur C. Martinez), The New York Times (Spencer Trask), Stanley Black & Decker (John Trani), American International Group (Harvey Golub), American Express (Edward P. Gilligan), Qwest (Joseph Nacchio), Chase Bank (Walter V. Shipley), CBS (Laurence Alan Tisch), Bristol-Myers Squibb Company (Charles A. Heimbold, Jr.), Citigroup (Robert I. Lipp), Morgan Stanley (Robert A. Kindler), Marvel Entertainment (John Turitzin), ConocoPhillips (John Carrig), Deloitte (Barry Salzberg), Sony Pictures Entertainment (Peter Guber), GQ (Steven Florio), Viacom (Thomas E. Dooley), Liberty Media (John C. Malone), Verizon (Lawrence Babbio Jr.) and Chemtura (Vincent A. Calarco). Pioneer of Silicon Valley, Eugene Kleiner, and World Trade Center site owner, Larry Silverstein, are also alumni of NYU. The following are examples of some of the many notable members of some of the many notable graduating classes: class of 1941, which graduated three later Nobel Prize laureates (Julius Axelrod, Gertrude B. Elion and Clifford Shull), Olympic Gold Medalist John Woodruff, sportscaster Howard Cosell, former dean of Duke University's School of Engineering Walter J. Seeley and sociologist Morris Janowitz; 1951 included professor emeritus at MIT and former DARPA director Jack Ruina, former chair of the Computer Science Department at University of California, Berkeley Martin H. Graham and Cathleen Synge Morawetz, first woman recipient of National Medal of Science; 1957 included Pulitzer Prize winning author Frank McCourt, former dean of Northwestern University's School of Engineering and Applied Science Bruno A. Boley and former president of Technion-Israel Institute of Technology Josef Singer; 1964 included former Chief Engineer of NASA Johnson Space Center Jay Greene, Turing Award winner Judea Pearl, former Cooper Union Engineering School Dean and the first female dean of an engineering school in the United States Eleanor K. Baum, former chair of the Division of Engineering and Applied Science at California Institute of Technology K. Mani Chandy, former Vice Provost and Dean of Research at Stanford University Arthur Bienenstock, former head of the Nuclear Science and Engineering Department at Massachusetts Institute of Technology Jeffrey P. Freidberg, former scientist of the NASA Jet Propulsion Laboratory and the first space tourist to fund his own trip into space Dennis Tito, former Commissioner of the National Football League (NFL) Paul Tagliabue, and film director Martin Scorsese; 1974 included astronaut and Senior Advisor for Engineering Development at NASA Langley Research Center Charles Camarda, chairman of the chemical engineering department at Johns Hopkins University Jerome Gavis, United States Navy Captain and astronaut Lee Morin and astronaut and NASA Space Flight Medalist Paolo Nespoli; and 1977 included: former Fed Chairman Alan Greenspan; IRS Commissioner Mark Everson; former INSEAD Dean Gabriel Hawawini; Pulitzer, Oscar and Tony Award winner John Patrick Shanley; NHL Commissioner Gary Bettman; NASDAQ CEO Robert Greifeld; Ma Ying-jeou president of Taiwan; Guillermo Endara president of Panama, Clive Davis music industry executive, and Cathy Minehan, Federal Reserve Chairman Boston. NYU has been portrayed in books, movies and television shows, and the campus of NYU has been the backdrop for a number of different books and movies. ^ a b c "About NYU". New York University. New York University. Retrieved August 30, 2013. ^ Communications, NYU Web. "Fiscal 2018 Budget". ^ NYU Web Communications. "The Election of William Berkley, Stern '66, as Chair-Designate of the NYU Board of Trustees". nyu.edu. ^ NYU Web Communications. "Office of the Provost". nyu.edu. ^ a b "College Navigator - New York University". Nces.ed.gov. Retrieved February 17, 2016. ^ "Common Data Set 2012–2013" (PDF). Institutional Research and Program Evaluation. New York University. Retrieved October 31, 2013. ^ The total number of administration staff listed here refers to the total number of employees in office and administrative support occupations at the Washington Square and School of Medicine campuses only. ^ Orlando Sentinel (December 5, 2013). "NYU college tour: Great school but very expensive - Orlando Sentinel". OrlandoSentinel.com. ^ a b "Schools and Colleges". New York University. New York University. Retrieved December 30, 2017. ^ "Global Academic Centers". New York University. ^ "The Global Network University". New York University. New York University. Archived from the original on August 25, 2013. Retrieved August 30, 2013. ^ Beckman, John (15 November 2018). "NYU to set up program in Los Angeles". nyu.edu. Retrieved 28 November 2018. ^ a b c Beckman, John (March 28, 2019). "NYU Admits Most Diverse Class in Its History". nyu.edu. Retrieved April 3, 2019. ^ "World University Rankings". Timeshighereducation.com. August 18, 2017. Retrieved September 14, 2018. ^ O'Donnell, Paul (February 20, 2013). "Billionaire U: Why Harvard Mints Mega-Rich Alums". CNBC. CNBC LLC. Retrieved November 22, 2015. ^ "These 7 Schools Have the Richest Alumni — Is Yours On the List?". mic.com. Retrieved October 16, 2015. ^ "World's top 100 universities for producing millionaires". Times Higher Education. Retrieved October 16, 2015. ^ a b "World's top 100 universities for producing millionaires". Times Higher Education. ^ "Top 15 Universities With the Most Wealthy Alumni". ABC News. ^ a b "Billionaire U: Why Harvard Mints Mega-Rich Alums". CNBC News. ^ "Major Gift Fundraising Potential: Global UHNW Alumni Report - Wealth-X". Wealth-X. Retrieved June 24, 2018. ^ Frusciano, Thomas & Pettit, Marilyn (1997). New York University and the City: An Illustrated History. New Brunswick, NJ: Rutgers University Press. ^ a b c d e Friss, Evan. "A Window Into the Past: NYU in Retrospect". NYU Archives. New York University. Retrieved August 30, 2013. ^ "175 Facts About NYU". NYU.edu. Retrieved December 29, 2010. ^ "Capital Campaign". Hofstra University. Archived from the original on December 23, 2008. Retrieved February 22, 2009. ^ "Member Institutions and Years of Admission". Association of American Universities. Association of American Universities. Retrieved August 30, 2013. ^ "About AAU". Association of American Universities. Association of American Universities. Retrieved August 30, 2013. ^ a b c d "NYU and the Village: History". New York University Archives. Retrieved July 17, 2007. ^ Chronopoulos, Themis. "Urban Decline and the Withdrawal of New York University from University Heights, The Bronx". The Bronx County Historical Society Journal XLVI (Spring/Fall 2009): 4–24". Archived from the original on October 31, 2014. Retrieved December 6, 2012. ^ a b Sanz, Cynthia (January 5, 1986). "Brooklyn'S Polytech, A Storybook Success". The New York Times. The New York Times Company. Retrieved November 22, 2015. ^ Laura Turegano (December 13, 2001). ""Fundraising Beyond U.S. Borders – NYU: A Success Story"". Onphilanthropy.com. Archived from the original on January 5, 2006. Retrieved October 18, 2016. ^ Weiss, Kenneth R. (March 22, 2000). "NYU Earns Respect" (PDF). Los Angeles Times. Retrieved October 11, 2007. ^ Honan, William H. (March 20, 1995). "Buying Excellence: How N.Y.U. Rebuilt Itself – A special report. ; Decade and $1 Billion Put N.Y.U. With the Elite". The New York Times. Retrieved March 5, 2008. ^ "Higher Education Leaders From Around the World Meet at NYU to Discuss Financial Challenges and Fundraising". NYU Office of Public Affairs. February 12, 1999. Retrieved October 11, 2007. ^ "League of World Universities meets for forum". Minnesota Daily. October 2, 2002. Archived from the original on April 14, 2008. Retrieved October 11, 2007. ^ "NYU Kicks Off $2.5 Billion Campaign". NYU Office for University Development and Alumni relations. January 2005. Archived from the original on June 12, 2007. Retrieved July 15, 2007. ^ Kaminer, Ariel (May 18, 2014). "Workers at N.Y.U. 's Abu Dhabi Site Faced Harsh Conditions". The New York Times. Retrieved May 20, 2014. ^ Kaminer, Ariel; O'Driscoll, Sean (May 18, 2014). "Workers at N.Y.U. 's Abu Dhabi Site Faced Harsh Conditions". The New York Times. ^ "N.Y.U. Apologizes to Any Workers Mistreated on Its Abu Dhabi Campus". The New York Times. May 20, 2014. ^ David Batty. "NYU set to compensate thousands of migrant workers on Abu Dhabi complex | Global development". The Guardian. Retrieved February 17, 2016. ^ "Surprise Gift: Free Tuition for All N.Y.U. Medical Students". Retrieved September 8, 2018. ^ "Home - Grey Gallery". Grey Gallery. ^ Masterson, Kathryn (2008). "NYU Sets Record With $3.1-Billion Campaign". Retrieved November 1, 2008. ^ a b Beckman, John (April 28, 2004). New York University Kick Off $2.5 Billion Fundraising Campaign. NYU Office Public Affairs. Retrieved September 4, 2007. ^ "The Campaign for NYU". NYU Office for University Development & Alumni Relations. Archived from the original on August 22, 2007. Retrieved September 4, 2007. ^ NYU Alumni Constance & Martin Silver Donate $50 Million to University's School of Social Work. NYU Office Public Affairs. October 15, 2007. Retrieved October 17, 2007. ^ Jaschik, Scott (October 17, 2007). Quick Takes. Inside Higher Ed. Retrieved October 17, 2007. ^ Souccar, Miriam (2008). "Local universities report banner fundraising years". Retrieved August 2, 2008. ^ Platt, Eric (2008). "Over seven years, NYU rakes in $3 billion". Archived from the original on January 13, 2009. Retrieved September 9, 2008. ^ Portlock, Sarah (April 24, 2007). "NYU unveils 25-year plan". Washington Square News. Archived from the original on August 22, 2007. Retrieved September 4, 2007. ^ a b "NYU, Ivy Leagues Top Schools for Green Power". GreenBiz.com. April 19, 2007. Archived from the original on October 12, 2007. Retrieved September 12, 2007. ^ a b "NYU buys more wind power credit". Washington Square News. November 15, 2007. Archived from the original on December 1, 2008. Retrieved July 22, 2008. ^ a b "NYU to Purchase Wind-Generated Power As Part of New Sustainability Initiative". NYU Office of Public Affairs. October 5, 2006. Retrieved September 12, 2007. ^ Fleming, Katherine (May 15, 2017). "The 2017-2018 Budget". nyu.edu. Retrieved July 22, 2018. ^ Melissa Korn (April 16, 2015). "For U.S. Universities, the Rich Get Richer Faster". WSJ. ^ "NYU Columbia Make A Mint on Real Estate". observer.com. Observer Media. Retrieved October 23, 2016. ^ "NYU Martin Dorph Talks University's Real Estate Holdings". Commercialobserver.com. July 24, 2018. Retrieved September 14, 2018. ^ "New York Campus". New York University. New York University. Retrieved October 31, 2013. ^ "NYU's Global Network". New York University. New York University. Retrieved October 31, 2013. ^ a b c "On Campus Living". New York University. New York University. Retrieved October 31, 2013. ^ a b "Top Ten Residence Hall Systems". University of Michigan Housing. Archived from the original on March 5, 2007. Retrieved July 16, 2007. ^ "Commencement ceremony". NYU. Retrieved April 17, 2010. ^ "Speech at New York University". GlobalSecurity.org. April 20, 2004. Retrieved July 15, 2007. ^ "Former Vice President Al Gore Remarks to MoveOn.org". MoveOn.org. August 7, 2003. Archived from the original on July 15, 2007. Retrieved July 15, 2007. ^ "The Skirball Center for the Performing Arts". NYU Office for University Development and Alumni Relations. Archived from the original on February 20, 2002. Retrieved July 15, 2007. ^ "Helen and Martin Kimmel Center for University Life, NYU". Kevin Roche John Dinkeloo and Associates LLC – Architects. Archived from the original on February 22, 2005. Retrieved July 15, 2007. ^ "About the NYU Libraries". NYU Libraries. June 2007. Archived from the original on October 12, 2007. Retrieved July 15, 2007. ^ "The Avery Fisher Center for Music and Media". New York University Libraries. New York University. Archived from the original on November 2, 2013. Retrieved October 31, 2013. ^ "Digital Studio". New York University Libraries. New York University. Retrieved October 31, 2013. ^ "Special Collections and Archives". New York University Libraries. New York University. Archived from the original on October 29, 2013. Retrieved October 31, 2013. ^ NYU Web Communications. "Route A". nyu.edu. ^ NYU Web Communications. "Passenger Information". nyu.edu. ^ a b "Top 50 Game Design Schools and Colleges in the US – 2015". animationcareerreview.com. ^ "MAGNET - NYU Media and Games Network". nyu.edu. ^ Frost, Mary (October 29, 2014). "NYU Langone to take over LICH emergency department in Brooklyn on Friday". Brooklyn Daily Eagle. Retrieved April 4, 2016. ^ "NYU's $500M Downtown Brooklyn expansion will open this summer". Curbed NY. Retrieved November 14, 2017. ^ "Contact Us". NYU School of Medicine. NYU Langone Medical Center. Archived from the original on July 4, 2011. Retrieved October 31, 2013. ^ "About Us". Hospital for Joint Diseases. NYU Langone Medical Center. Retrieved October 31, 2013. ^ "Bellevue Hospital Center". NYU Langone Medical Center. NYU Langone Medical Center. Retrieved October 31, 2013. ^ "Contact". NYU Silver School of Social Work. New York University. Retrieved October 31, 2013. ^ "Nelson Institute of Environmental Medicine". Pulmonary, Critical Care, & Sleep Medicine – Department of Medicine. NYU Langone Medical Center. Archived from the original on April 1, 2013. Retrieved October 31, 2013. ^ "Visit Us". NYU School of Professional Studies. New York University School of Professional Studies. Retrieved October 31, 2013. ^ "Institute for the Study of the Ancient World". Institute for the Study of the Ancient World. New York University. Retrieved October 31, 2013. ^ "Contact the Institute". NYU Institute of Fine Arts. New York University. Retrieved October 31, 2013. ^ "Research Centers, Institutes, and International Houses". NYU Arts & Science. New York University, Arts and Science. Archived from the original on October 30, 2013. Retrieved October 31, 2013. ^ "NYU's Tisch School Of The Arts opens its first campus in Singapore". Archived from the original on February 23, 2012. Retrieved August 22, 2008. ^ "Tisch Asia in a flux following president's removal". Retrieved November 9, 2012. ^ "Ex-Tisch Asia president takes NYU to court". Archived from the original on November 19, 2012. Retrieved November 9, 2012. ^ Eustachewich, Lia (September 20, 2016). "NYU students claim defunct Tisch Asia was a rip-off in suit". Nypost.com. Retrieved September 24, 2016. ^ "Ex-students call NYU's Singapore art school an 'educational scam'". Nydailynews.com. Retrieved September 24, 2016. ^ "NYU Opens Academic Center In Washington, DC". NYU. 2012. Retrieved October 12, 2012. ^ "Global Academic Centers". New York University. Retrieved February 14, 2012. ^ "NYU marks years of successful restoration at La Pietra". NYU Today. 16 (1). September 5, 2002. Retrieved July 16, 2007. ^ "À Paris, la New York University déménage et lance une clinique du droit – Educpros". Letudiant.fr. October 28, 2013. Retrieved August 14, 2014. ^ "NYU Abu Dhabi University & College in UAE, New York University". New York University Abu Dhabi. Retrieved February 14, 2012. ^ Foderaro, Lisa W. (June 20, 2010). "N.Y.U. Abu Dhabi Scours Globe for Its First Students". New York Times. Retrieved February 14, 2012. ^ Timm, Jane (September 13, 2010). "NYU Abu Dhabi: the story from concept to classroom". nyunews.com. Archived from the original on September 17, 2010. Retrieved November 22, 2010. ^ "China's Education Ministry Approves NYU Portal Campus in Shanghai". NYU Local. January 21, 2011. Retrieved April 21, 2011. ^ Hennock, Mary, "New Leader of NYU Shanghai Has Built Other Bridges to China", Chronicle of Higher Education, April 29, 2012. Retrieved April 30, 2012. ^ "Mission Statement". Inter-Residence Hall Council. Inter-Residence Hall Council. Archived from the original on November 2, 2013. Retrieved October 31, 2013. ^ Turley, Meredith (July 1, 2006). New York University: Off the Record. College Prowler. p. 161. ISBN 978-1-4274-0102-1. ^ "Routes and Schedules". Department of Public Safety. New York University. Retrieved October 31, 2013. ^ "Living at NYU". New York University. New York University. Retrieved October 31, 2013. ^ "Explore the Residence Halls". New York University. New York University. Retrieved October 31, 2013. ^ "Awards". Inter-Residence Hall Council. Inter-Residence Hall Council. Archived from the original on November 2, 2013. Retrieved October 31, 2013. ^ "NYU Sustainability Fast Facts". New York University. Retrieved June 8, 2009. ^ "At New York University, green is the new violet". The Villager. Retrieved June 8, 2009. ^ "College Sustainability Report Card 2010". Sustainable Endowments Institute. Archived from the original on October 6, 2011. ^ Pogrebin, Robin (22 March 2010). "N.Y.U. Plans an Expansion of 40 Percent". The New York Times. Retrieved 28 November 2018. ^ "181 Mercer Street". nyu.edu. Retrieved 28 November 2018. ^ "Alumni Magazine Fall 2018". nyu.edu. Retrieved 28 November 2018. ^ "Factbook". NYU. Retrieved August 23, 2018. ^ "NYU Facts". New York University. New York University. Retrieved April 3, 2019. ^ a b "NYU Stern | Class Profile". Stern.nyu.edu. Retrieved September 27, 2016. ^ "New York University | Best Engineering School | US News". Grad-schools.usnews.rankingsandreviews.com. Retrieved September 27, 2016. ^ "Graduate School of Arts and Science New York University". petersons.com. Retrieved October 2, 2016. ^ "NYU Law School | Law School Numbers". Nyu.lawschoolnumbers.com. Retrieved September 27, 2016. ^ "Student Composition | Education and Training". Med.nyu.edu. Retrieved September 27, 2016. ^ "NYU Schools and Colleges". nyu.edu. Retrieved January 9, 2019. ^ "About CAS". NYU College of Arts & Science. New York University, Arts and Science. Archived from the original on September 22, 2013. Retrieved August 30, 2013. ^ "NYU's Global Network" (PDF). nyu.edu. Retrieved January 9, 2019. ^ Beckman, John (November 13, 2018). "NYU #1 Again in Both International Students and Study Abroad". nyu.edu. Retrieved January 9, 2019. ^ Local, N. Y. U. (2015-03-18). "Oxford University Administrator Named Next NYU President". NYU Local. Retrieved 2019-01-09. ^ Hamilton, Andrew (September 25, 2016). "Inauguration Speech of Andrew Hamilton". Retrieved January 9, 2019. ^ "NSF – NCSES Academic Institution Profiles – Rankings by total R&D expenditures". Ncsesdata.nsf.gov. Retrieved February 17, 2016. ^ "Top 100 Worldwide Universities Granted U.S. Utility Patents" (PDF). Academyofinvestors.org. 2014. Retrieved October 24, 2016. ^ "NYU Acquires Fastest Supercomputer in New York City". Nyu.edu. Retrieved October 18, 2016. ^ "Cybersecurity Team Makes NYU Tandon a Crucible for Microchip Security | NYU Tandon School of Engineering". Engineering.nyu.edu. Retrieved October 18, 2016. ^ "NYU Overall Rankings - US News Best Colleges". Colleges.usnews.rankingsandreviews.com. Retrieved September 24, 2016. ^ a b "CWUR World University Rankings 2018-2019". Cwur.org. Retrieved April 17, 2019. ^ "QS World University Rankings® 2015/16". ^ "Top 200 Universities in the World". 4icu.org. Retrieved April 17, 2019. ^ "New York University". Times Higher Education. ^ "Best Applied Mathematics Programs - Top Math Schools - US News Best Graduate Schools". rankingsandreviews.com. Archived from the original on November 1, 2013. ^ "Best Graduate Schools". U.S. News & World Report LP. Archived from the original on April 24, 2009. Retrieved April 21, 2014. ^ "Academic Ranking of World Universities in Social Science - 2015". Academic Ranking of World Universities. Retrieved October 1, 2015. ^ "Top 100 universities for social sciences 2015". Times Higher Education. Retrieved October 1, 2015. ^ "QS World University Rankings by Faculty 2015 – Social Sciences and Management". Top Universities. August 28, 2015. Retrieved October 1, 2015. ^ "New York University (NYU) Rankings". Top Universities. Retrieved October 1, 2015. ^ "Ranking of U.S. Psychology Ph.D. Programs by Area". Socialpsychology.org. Retrieved August 14, 2014. ^ "New York University | Best Social Sciences & Humanities School | US News". Grad-schools.usnews.rankingsandreviews.com. Retrieved August 14, 2014. ^ "New York University | Best Law School | US News". Grad-schools.usnews.rankingsandreviews.com. Retrieved August 14, 2014. ^ "The Philosophical Gourmet". Blackwell Publishing Philosophy. 2011. ^ "QS World University Rankings by Subject 2015 – Philosophy". Top Universities. September 15, 2015. Retrieved October 1, 2015. ^ "Unigo: Top 10 New Ivies 2013". Huffingtonpost.com. August 30, 2012. Retrieved August 14, 2014. ^ "America's 25 New Elite 'Ivies'". Newsweek. August 21, 2006. Archived from the original on July 8, 2007. Retrieved July 16, 2007. ^ "Education – Image". NYTimes.com. October 28, 2013. Retrieved August 14, 2014. ^ "Emerging Employability University Ranking". Emerging.fr. January 1, 1980. Retrieved August 14, 2014. ^ Satish K. "Prime Colleges: New York University". Primecolleges.blogspot.in. Retrieved August 18, 2016. ^ "Top 100 Worldwide Universities Granted U.S. Utility Patents" (PDF). Academyofinvestors.org. 2014. Retrieved August 18, 2016. ^ ABC News. "Top 15 Universities With the Most Wealthy Alumni - ABC News". ABC News. ^ Leonard, Barbara (November 4, 2005). "Coca-Cola given ultimatum". Washington Square News. Archived from the original on January 13, 2009. Retrieved October 12, 2007. ^ Woyke, Elizabeth (January 23, 2006). "How NYU Chose Colombia over Coke". Business Week. Archived from the original on August 8, 2007. Retrieved October 12, 2007. ^ Smallwood, Scott (March 16, 2001). "A Big Breakthrough for T.A. Unions". The Chronicle of Higher Education. Archived from the original on April 24, 2008. Retrieved October 12, 2007. ^ Coe III, Richard M. (December 6, 2005). "NYU graduate assistants pledge to continue strike". Daily Tar Heel. Archived from the original on February 10, 2009. Retrieved October 12, 2007. ^ Hernandez, Sergio (February 5, 2009). Coke ban lifted. Washington Square News. Archived from the original on February 7, 2009. Retrieved February 8, 2009. ^ Pilgreen, Justin (December 6, 2018). ""OurSGA-NYU" Facebook Page Calls for Sweeping Changes to Student Government". NYU Local. Retrieved January 9, 2018. ^ "New York University:Housing & Campus Life". College Board. 2007. Retrieved October 10, 2007. ^ "Clubs and Organizations". New York University. New York University. Retrieved October 31, 2013. ^ "Club Directory". Center for Student Activities, Leadership & Service. New York University. Retrieved October 31, 2013. ^ NYU Web Communications. "NYU Crowned National Mock Trial Champion". nyu.edu. ^ "UCLA Mock Trial team takes first at American Mock Trial Association 27th National Championship Tournament". dailybruin.com. ^ "AMERICAN MOCK TRIAL ASSOCIATION : 2015-2016 TEAM POWER RANKINGS" (PDF). Collegemocktrial.org. Retrieved August 18, 2016. ^ "Guide to the Andiron Club of New York City". New York University Archives. Retrieved July 17, 2007. ^ "A Window Into the Past: NYU in Retrospect". New York University Archives. Retrieved July 15, 2007. ^ "175 Facts About NYU". New York University Archives. Retrieved July 15, 2007. ^ Friss, Evan (September 13, 2004). "Chronicles: A Look at NYU's Past". NYU Today. 18 (1). Retrieved July 17, 2007. ^ "Welcome Week". New York University. New York University. Retrieved October 31, 2013. ^ "New York University". In Like Me. InlikeMe and Phrazorp LLC. Retrieved October 31, 2013. ^ a b "New York University - Archivist's Angle: The Medley". Alumni.nyu.edu. Retrieved February 17, 2016. ^ "History of The Plague". Ny.edu. Retrieved September 24, 2016. ^ "Memories of The Plague". Dan Fiorella: Writer @ large. ^ "The Plague". Ny.edu. Retrieved September 24, 2016. ^ a b "Psi Upsilon History". Psi Upsilon Fraternity. 2006. Archived from the original on April 14, 2007. Retrieved July 17, 2007. ^ a b Sunshine, Jared (2007). "History". Zeta Psi Fraternity of North America, Inc. Archived from the original on July 29, 2007. Retrieved July 17, 2007. ^ "New York University: Campus Life". US News & World Report. 2014. Retrieved March 20, 2014. ^ "Who We Are". Inter-Greek Council. New York University Inter-Greek Council. Retrieved October 31, 2013. ^ "Our History". Tau Delta Phi Fraternity, Inc. 2007. Archived from the original on September 20, 2008. Retrieved October 20, 2008. ^ "History". International Business Fraternity of Delta Sigma Pi. 2008. Archived from the original on March 19, 2008. Retrieved April 25, 2008. ^ "History – Alpha Epsilon Pi". Kintera, Inc. Archived from the original on May 23, 2007. Retrieved July 17, 2007. ^ "Alpha Phi Omega NYU | Beta Iota Chapter". Alpha Phi Omega NYU | Beta Iota Chapter. Retrieved April 22, 2018. ^ "History and Traditions". Delta Phi Epsilon International Sorority. Archived from the original on June 28, 2007. Retrieved July 17, 2007. ^ "About". Delta Phi Gamma Chapter. NYU Delta Phi Gamma Chapter. Archived from the original on November 2, 2013. Retrieved October 31, 2013. ^ "Rush FAQ'S". Zeta Beta Tau Gamma Chapter. NYU Zeta Beta Tau Gamma Chapter. Archived from the original on November 2, 2013. Retrieved October 31, 2013. ^ NYU Web Communications. "Frequently Asked Questions". nyu.edu. ^ "History of the Bobcat". New York University. Archived from the original on June 12, 2007. Retrieved December 29, 2010. ^ "NYU Athletics". New York University. Retrieved April 22, 2011. ^ "The Organization". National Intercollegiate Women's Fencing Association. Retrieved July 17, 2007. ^ "ACHA Approves New York University to Men's Division 1 | ACHA". achahockey.org. Retrieved 2018-11-12. ^ "DI Men's Ice Hockey Rankings - RPI | NCAA.com". www.ncaa.com. Retrieved 2018-11-12. ^ Kleeman, Sophie (April 19, 2012). "We Are The Champions, Sometimes: The Highs And Lows Of NYU Athletics". NYU Local. New York University. Retrieved October 31, 2013. ^ "New York University - NYU Alumni Home". imodules.com. ^ "Inspired by teflon, researchers create super durable proteins". Phys.org. July 4, 2011. Retrieved December 12, 2016. ^ "Patents by Inventor Richard J. Orford". Patents.justia.com. Retrieved December 8, 2016. ^ "The Graduate School at Polytechnic Institute of New York University" (PDF). Engineering.nyu.edu. Retrieved December 8, 2016. ^ "Invention, Innovation and Entrepreneurship Begin at the NYU Polytechnic School of Engineering by Spark451". Issuu.com. April 21, 2014. Retrieved December 8, 2016. ^ "Straight Out of Star Trek". Nyu.edu. Retrieved September 24, 2016. ^ "BROOKLYN'S POLYTECH, A STORYBOOK SUCCESS". The New York Times. January 5, 1986. Retrieved October 19, 2016. ^ "Invention, Innovation and Entrepreneurship Begin at the NYU Polytechnic School of Engineering". issuu. January 5, 2013. Retrieved October 22, 2016. ^ "Leopold H. Just, 95, Is Dead - Designer of New York Bridges". NYTimes.com. March 7, 1999. Retrieved October 15, 2016. ^ "Eugene Kleiner, Early Promoter Of Silicon Valley, Is Dead at 80". Associated Press. November 26, 2003 – via The New York Times. ^ "List of Public Companies Worldwide, Letter - Businessweek - Businessweek". Bloomberg.com. Retrieved February 17, 2016. Dim, Joan (2000). The Miracle on Washington Square. Lanham, MD: Lexington Books. Frusciano, Thomas & Pettit, Marilyn (1997). New York University and the City: An Illustrated History. New Brunswick, NJ: Rutgers University Press. Gitlow, Abrahm L. (1995). NYU's Stern School of Business: A Centennial Retrospective. New York: NYU Press. Harris, Luther S. (2003). Around Washington Square : An Illustrated History of Greenwich Village. Baltimore, MD: Johns Hopkins University Press. Hester, James M. (1971). New York University; the urban university coming of age. New York: Newcomen Society in North America. OCLC 140405. Jones, Theodore F. (1933). New York University, 1832–1932. London: H. Milford, Oxford University Press. Lewis, Naphtali (1968). Greek papyri in the collection of New York University. Leiden: E.J. Brill. Tonne, Herbert A., ed. (1981). Early Leaders in Business Education at New York University. Reston, Virginia: National Business Education Association. Potash, David M. (1991). The Graduate School of Arts and Sciences at New York University: A History. New York: NYU Arts and Sciences Publications. Wikisource has the text of The New Student's Reference Work article about "New York University". "New York University collected news and commentary". The New York Times. "New York University" . Collier's New Encyclopedia. 1921. "New York University" . New International Encyclopedia. 1905.